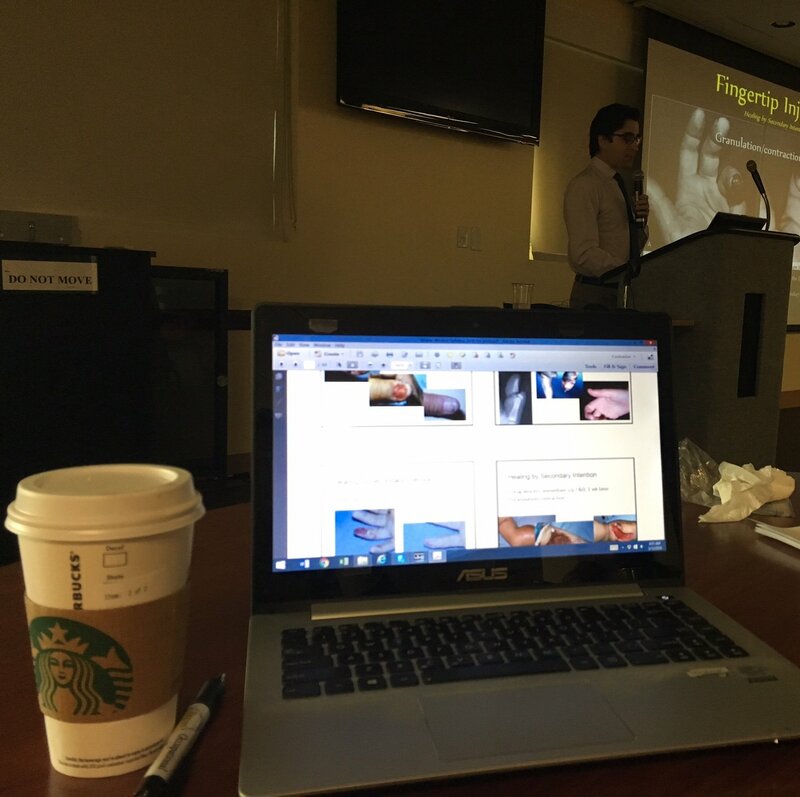 This past weekend, I was able to attend a wound care course with a nice group of Miami occupational therapist, physical therapist, and hand surgeons. There were many from the surrounding South Florida area as well. As a certified hand therapist, I do a lot of wound care in my clinic and have had many years of extensive practice, it is always great to make sure I am keeping up with the trends in wound care and also learning from other doctors and therapist some of their tips of the trade! Wound care can be as simple as taking out one stitch or taking out many. It can be as involved as cleaning a deep large wound and knowing how to dress it properly. Either way, wounds need to be helped to close as soon as possible so that risk of infections are reduced, and that we can progress with the therapy to return you back to doing the things you love! Increase redness. Of course the boarders of the wound can be red but you need to look for CHANGES of that redness that spreading and getting larger. Increase in swelling. Look at you area of injury. You hurt it, had surgery, of course it’s swollen. If it’s a little more swollen but goes up and down, that’s normal for you. If it gets WORST, i.e. there is a change in how much more swollen it is, then that is a concern. Usually this results in increase PAIN. A foul odor. Smell it. It’s ok. You need to know what it smells like. If it smells stale because you haven’t washed that part, well then eewwww. But it’s of no concern. If there is a change and it smells of a very particularly bad smell, then it’s a concern. You will know, it’s a very particular smell. In any of these cases, you should contact your doctor. These are the signs that I look for, and these are the things that I always tell my patients that come to me with stitches or open wound. The key message to take home is if there is a CHANGE in any of these things. Wounds in generally can look so different, it’s hard to really explain it all. The most basic explanation of it that I use is that wounds need to heal from the bottom up and the sides in. It can’t be too dry and it can’t be too wet….kinda like Goldilocks….it needs to be just perfect. I like my wounds and incisions to be nice and pretty. I like to clean them up if they have a lot of dead skin or s=dry scab because for one, I don’t want you to be afraid of it. Secondly, anything hanging around the boarders can get in the way of healing and create areas that trap too much moisture. There are many ways to clean a wound, it really depends on what it looks like, and it can change from one day to the next as it’s healing. Cleaning the wound can be as easy as just washing your hands with soap and water. 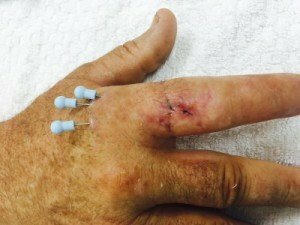 Sometimes, it may need a dressing so that it doesn’t stick to the gauze and can get rid of some of that sucky yellowish stuff. Depending on what it looks like, a wet to dry dressing maybe needed. So many factors. However, I would recommend to NOT clean with peroxide. It is very drying. There are times like when you scrap your knee that you can use it, but for the most part, I don’t like to use peroxide on my incisions or open wounds. The ideal look of a wound is on that has nice pink borders, and the bed of it is pink and looks like there a small red bumps. That’s actually good granulating tissue. It’s ok if there some light blood too. Just keep you incisions CLEAN and DRY! And if you get it wet, please change it, don’t just leave the wetness there. If you had surgery and have stitches or an open wound, have your therapist go over how your wound is looking, the directions to keep it clean and promote closure. If your therapist doesn’t….well then….come find me. Thank you! Will look into that asap!